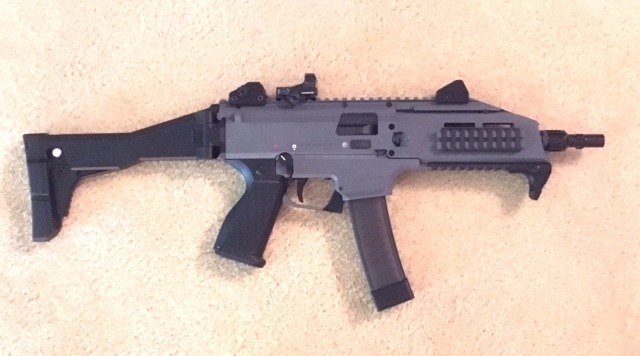 Latest demo submachinegun -- an SBR'd CZ Scorpion Evo that now has a post-sample full-auto (select fire) conversion. It has a 3-lug adapter for quick suppressor on/off. It doesn't have the 3-shot-burst position like the factory issued submachinegun does, but hey, it's all about trigger control. Since it doesn't have the burst, that would probably indicate that it's not likely a factory trigger pack. With that said, did you convert it to open bolt, like another member here did (don't want to mention names). Add another asking for videos. Yes, not a factory trigger pack... major changes are replacements using a different configuration trip, selector, and paired semi & full disconnectors. It still functions as closed bolt. I'll get video the next time I take it out! "...set the fire mode lever into the position "III". If the gun is loaded and there are enough cartridges in the magazine, when the trigger is pulled and held, three cartridges will be fired." Wish I could convert by SBRd Evo3 to FA. Hadn't heard that song or seen that video... "it'll just take money"
Awesome gun. Love the grey. Want to shoot full auto EVO3 Scorpion and the MP7. As promised -- video! Well, kinda... I put 6 magazines through it (three suppressed, 3 without) and had no failures -- EXCEPT the failure of my video camera battery, so only the first four bursts were captured! Hopefully we'll take it back out soon for some more (and better) video. I've ordered a 3-lug adapter for my Bowers Vers9s. This shows shooting 147gr 9mm through a Dead Air Ghost-M suppressor on it (45 acp but with wipe) and although it's hearing safe, it's not great. Judging by my experience with a semi-auto Scorp, I suspect the recoil impulse is pretty harsh? I suspect the recoil impulse is pretty harsh? not really, buy I'm a big guy, did you watch my video on the mannequin head, that gun barely moves ? ?